The American Red Cross is dedicated to training people to respond to, and prepare for, emergencies. In order to empower people, we offer world-class CPR training in Grand Rapids and throughout the state. Taught by experienced professionals, Red Cross classes are developed under the guidance of, and reviewed by, the Red Cross Scientific Advisory Council. Course materials are reviewed on a regular basis to ensure that the latest techniques and information are included in every course we teach. At the Red Cross, CPR classes in Grand Rapids are available in person, and online. During our online courses you'll learn the same information that's included in our in-person classes, but in lieu of hands-on experience, you'll practice your skills via simulated activities. However, because you won't be able to demonstrate your abilities to an instructor, the certification you receive may not be accepted by your employer. In order to receive full, OSHA-compliant CPR certification, you may be required to take an in-person or blended Simulation Learning course. Please check with your employer before enrolling. In order to help you provide care during a crisis, the Red Cross offers CPR classes in Grand Rapids that can help you learn both CPR with mouth-to-mouth (rescue) breaths and hands-only CPR. This way, you'll be well versed in the ways in which CPR can be performed – and can offer help when it's needed most. Whether your CPR certification is critical for your job or it's just for you, it's important to know that your credentials will expire two years from their award date. 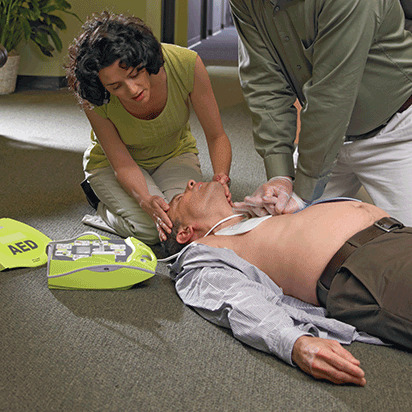 However, at the Red Cross in Grand Rapids, CPR certification is easy to maintain. We offer dozens of abbreviated recertification classes throughout the year so you can maintain your credentials and skills. Instead of signing up several (or all) of your employees for off-site CPR classes in Grand Rapids, you can bring Red Cross trainers to you. This way, you can give your teams the CPR training they need, without arranging for, or paying for, each member to travel to a training site. In-person classes like these include First Aid and AED usage, and take just a few short hours. Those who successfully complete the class will receive a two year OSHA-compliant certification, which can help your organization meet its health and safety goals. We not only offer CPR training in Grand Rapids for private individuals, first responders and organizations, but we also offer a special training program for schools, which includes their staff and their students. Find out how to take part in our program, and empower your educators and pupils with the tools to help those in need. The Red Cross delivers CPR classes and training in Grand Rapids that allows you to learn your way. With in-person classes and blended Simulation Learning opportunities, plus local, knowledgeable instructors who can guide you through important theories and practices, our courses give you access to world-class instruction that's just minutes from home.